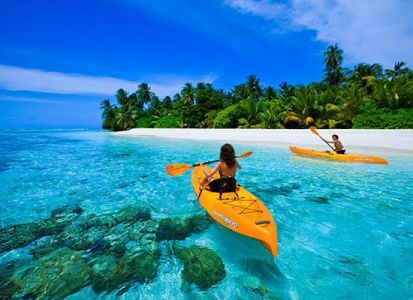 Lakshadweep, India’s smallest Union Territory is an archipelago consisting of 36 islands with an area of 32 sq km forming 12 atolls three reefs, five submerged banks and ten inhabited islands known for its exotic beaches and lush green landscape. The name Lakshadweep in Malayalam and Sanskrit means ‘a hundred thousand islands’. All Islands are 220 to 440 km away from the coastal city Kochi in Kerala. What are the main islands of Lakshadweep –Agatti, Amini, Andrott, Bangaram, Bitra, Chetlat, Kadmat, Kalpeni, Kavaratti, Kiltan and Minicoy (southern-most island of Lakshadweep). These are inhibited islands and based on the drinking water availability. Telecommunication - Only BSNL and Airtel provides telecommunication services to Lakshadweep Islands. BSNL provides connectivity in all 10 inhabited islands whereas Airtel provides connectivity to Kavaratti and Agatti islands. Early history of Lakshadweep is unwritten. Local traditions attribute the first settlement on these islands to the period of Cheraman Perumal, the last king of Kerala. It is believed that after his conversion to Islam, at the behest of some Arab merchants, he slipped out of his capital Cranganore, the present day Kodungallor – an old harbor town Kochi, for Mecca. When his disappearance was discovered, search parties went after him in sailing boats and left for the shores of Mecca, in search of the king from different places. 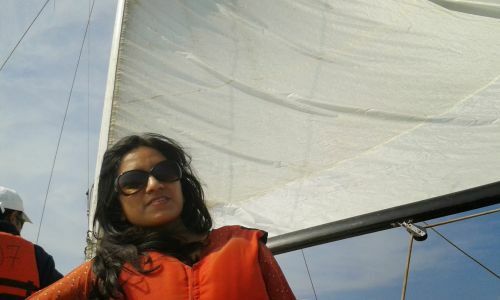 It is believed that one of these sailing boats of Raja of Cannanore was struck by a fierce storm and they were shipwrecked on the island now known as Bangaram. From there they went to the nearby island of Agatti. Finally the weather improved and they returned to the mainland sighting other islands on their way. It is said that after their return another party of sailors and soldiers discovered the island of Amini and started living there. It is believed that the people sent there were Hindus. Even now unmistakable Hindu Social stratification exists in these islands despite Islam. Legends say that small settlements started in the Islands of Amini, Kavaratti, Andrott and Kalpeni first and later people from these islands moved to the other islands of Agatti, Kiltan, Chetlat and Kadmat. The advent of Islam dates back to the 7th century around the year 41 Hijra. It is universally believed that one St.Ubaidullah(r) while praying at Mecca fell asleep. He dreamt that Prophet Mohammed(s) wanted him to go to Jeddah and take a ship from there to go to distant places. Thus, he left Jeddah but after sailing for months, a storm wrecked his ship near these small Islands. Floating on a plank he was swept ashore on the island of Amini. He fell asleep there but again dreamt of the Prophet asking him to propagate Islam in that Island. Ubaidullah started doing so. But this enraged the headman of the island and he ordered his exit at once. St. Ubaidullah(r) stood firm. Meanwhile, a young woman fell in love with him. He gave her the name Hameedat Beebi and married her. This further offended the headman and he decided to kill him. It is said that the headman and his henchmen surrounded Ubaidullah(r) and his wife to kill them. At once St.Ubaidullah(r) called up on the Almighty and the people were struck blind. At this time St.Ubaidullah(r) and his wife disappeared and as soon as they left the island people regained their eye sight.From Amini St.Ubaidullah(r) arrived at Andrott where he met with similar opposition but he succeeded finally in converting the people to Islam. He next went to other islands and successfully propagated Islam and returned to Andrott where he died, and was buried. The grave of St.Ubaidullah(r) is today a sacred place. Preachers from Androttare respected deeply in far off lands like Sri Lanka, Malaysia, Burma etc. It is a marabout or Mukbara. The Arrival of the Portuguese in India again made Laccadives an important place for seafarers. It was also the beginning of years of plunder for the islands. The finely spun coir was much sought after for ships. So the Portuguese started looting island vessels. They forcibly landed at Amini to procure coir sometime in the early 16th century, but it is said that the people killed all the invaders by poisoning, ending the Portuguese invasion. Even after the conversion of the entire islands to Islam, sovereignty remained in the hands of the Hindu Rajah of Chirakkal for some years. From the hands of the Chirakkal Raja, the Administration of the island passed on to the Muslim house of Arakkal of Cannanore around the middle of the 16th century. The Arakkal rule was oppressive and unbearable. So sometime in the year 1783 some islanders from Amini took courage and went to Tipu Sultan at Mangalore and requested him to take over the Administration of Amini group of islands. Tipu Sultan at that time was on friendly terms with Beebi of Arakkel and after deliberations, the islands of Amini group were handed over to him. Thus the islands suzerainty came to be divided as five came under the rule of Tipu Sultan and the rest continued under Arakkal house. After the battle of Seringapattom in 1799 the islands were annexed to the British East India Company and were administered from Mangalore. In 1847, a severe cyclone hit the island of Andrott and Raja of Chirakkal decided to visit the island in order to assess the damages and for distributing relief. ANOTHER BRITISH GAME An officer of the East India Company Sir William Robinson volunteered to accompany him. On reaching Andrott, the Rajah found it difficult to meet all the demands of the people. Sir William then offered the Rajah help in the form of a loan. This was accepted. This arrangement continued for about four years but when the interest started mounting, the English asked the Rajah to repay them which he could not. In 1854 all the remaining islands were handed over to the East India Company for Administration. so, came the British rule. 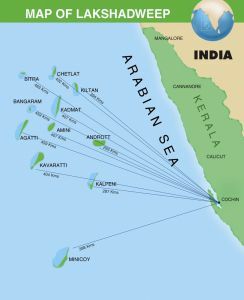 The Union Territory was formed in 1956 and it was named Lakshadweep in 1973. Lakshadweep Permit - The entry to Lakshadweep islands is restricted. One requires an entry permit issued by Lakshadweep Administration to visit these islands. Boat and helicopter transfers are available from Agatti to Bangaram and Kadmat. The helicopter (USD 150 return) may be the only option in monsoon season from May to September. By boats/ferries: These can be used for getting around from one island to the other but are very costly. Once on an island, there aren't too many options as the islands themselves are very small: most of them are less than 10 km in length and less than a kilometer in breadth between their extremes. You can travel by foot or hire a bicycle. There are three full-service resorts in Lakshadweep (though one of them, the Bangaram Island Resort, is currently not operating), which are also the only places where foreigners can stay. All prices listed below are for double rooms and include all meals. In addition, basic government resorts open to Indian citizens only are available at Minicoy, Kavaratti and Kalpeni. Some packages offered by sports include accommodation on board the ship, with only day visits to the islands. Lakshadweep Island can be reached by ships and flights operated from Kochi. For all tourist purposes Kochi is the gate way to Lakshadweep. Agatti and Bangaram islands can be reached by flight from Kochi. Indian Airlines operate flights from Kochi. Onward flights from Kochi are available to most of the airports in India and abroad. Airstrip is there in Agatti island only. From Agatti boats are available to Kavaratti and Kadmat during fair season October to May. Helicopter transfer is available from Agatti to Bangaram Island Resort during monsoon and to Kavaratti throughout the year. The flight from Cochin to Agatti takes approximately one hour and thirty minutes. Six passenger ships - MV Kavaratti, MV Arabian Sea, MV Lakshadweep Sea, MV Amindivi and MV Minicoy operate between Cochin and Lakshadweep. The passage takes 14 to 18 hours depending on island chosen for journey. The ships offer different classes of accommodation: A/C First Class with two berth cabins, A/C Second Class with four berth cabins and push back/Bunk Class with A/C seating. A doctor is available on call on board. MV Amindivi and MV Minicoy also offer comfortable A/C seating ideal for a night’s journey. 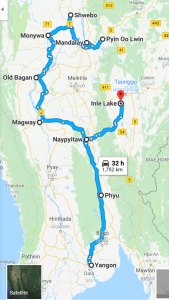 border checkpoints to enter Myanmar from Laos or Bangladesh. 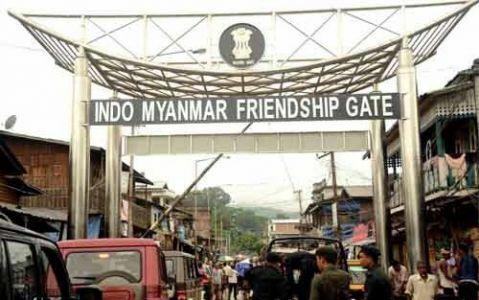 Division (Myanmar) and Manipur State (India) freely. always ensure the safety of our clients. 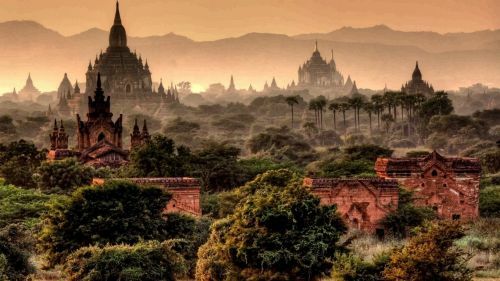 a visa exemption if crossing from Myanmar into Thailand). to other parts of the country. there are regular boat services. 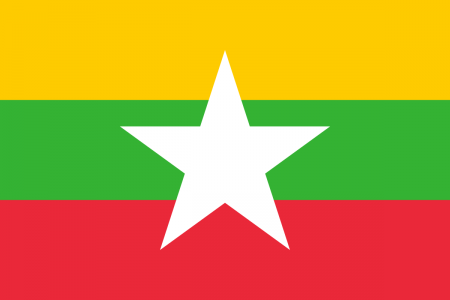 border into Myanmar, there are still limitations as to onward transportation. Dawei, which is about a five-hour drive from the border. Arranging onward transportation may be difficult, particularly during the rainy season. 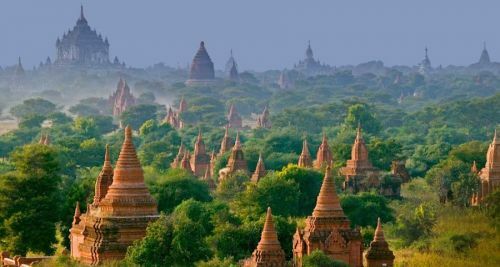 and Myanmar government also allows Burmese tourists to visit Singapore without a visa. for purpose of tourism without a visa. 3. Your passport must be valid for 6 months from the time you enter the country. 5. Payment should be done by credit, visa card, no cash or banking option. 5. Your address, telephone and email. If you want to go to Australia and you want Australian visa these are the conditions apply to an Australian eVisa (ETA)? 2. Valid for multiple visits within 12 months from the date of issue. 3. Maximum length of each visit is 3 months. 4. Your passport must have at least 6 months left before expiry from the date you wish to enter Australia. 5. Work is not allowed, you may however undertake business activities such as enquiries, contractual negotiations and attending conferences. 6. You must not study for more than 3 months. 7. You must be free from tuberculosis. 8. You must not have any criminal convictions for which you have been sentenced for a total combined period of 12 months or more, whether or not the sentence(s) were served. 10 .Price - Australian visa will cost you around INR 10,000. Day 1 - On our first day in Singapore, I kept it low-key and was exploring the historical parts of the city. Travelling is exhausting even if you're only in the air for a few hours. A little jet-lagged and travel-weary. We went to Singapore Art Museum. Opened in 1996, the museum houses the largest collection of modern Southeast Asia artworks. 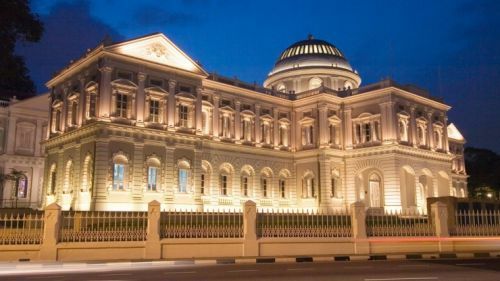 From there, it's just a short walk to the National Museum of Singapore, Singapore's oldest and largest museum and the keeper of the 11 National Treasures. Day 2 – We could have theoretically spent our entire Singapore vacation on Sentosa Island and never run out of things to do. Sentosa - crystal blue water lapping against the white sandy beach, while coconut trees sway in the gentle breeze. 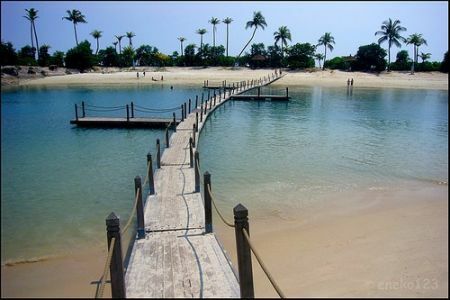 Tanjong beach on Sentosa is the best spot for relaxing "peace and tranquility"on Sentosa Island. We played volley ball there. 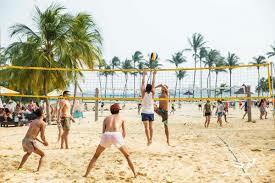 Silosa Beach is for the sporty types who like to play beach volleyball, and Palawan Beach is great if you want to stay close to all the action. EAT "must-have" Black Pepper Crabs. And Hainanese Chicken Rice. 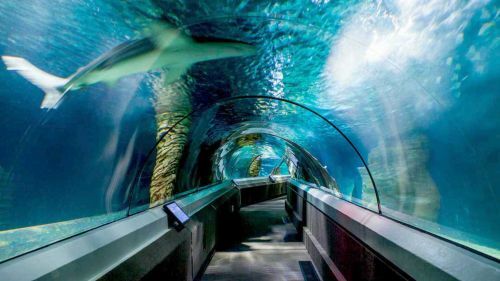 I took a tram to Siloso Point and walk into Sentosa Underwater World and Dolphin Lagoon. "Meet the Dolphins and Fu Seals" show. We were a little adventurous type and spent the rest of the afternoon at the MegaZip Adventure Park, where I flew above the tree canopy on a zip line. I didn’t try Sentosa CineBlast. - virtual rollercoaster. Later We went for dinner at Silk Road on Palawan Beach. The neatest thing about this contemporary restaurant is that its menu is based on the places along Marco Polo's route from North and South China to Venice, back in the 13th century. I finished by 7:30pm, as I didn’t want to miss ﻿Wings of Time﻿. Day 3 – We went to Marina Bay for some popular tourist attractions and a bit leisurely. I strolled along the Waterfront Promenade, I could see iconic Marina Bay Sands. I later went to Esplanade Theatres for a show and later went through the shops of the Esplanade Mall. We went to The Banyan Tree Gallery and it is a neat store that sells handcrafted goods made by local artisans. Afternoon We went to Singapore Flyer. Although it’s known for being the world's largest observation wheel, there is so much more to do than just soar high above the city in one of their special capsules. I did fly a plane..na na not the real one but almost real, in an awesome flight simulator and zipped around the track used by drivers for the famous Singapore GP F1 Night Race in a super-classy, super-fast sports car. 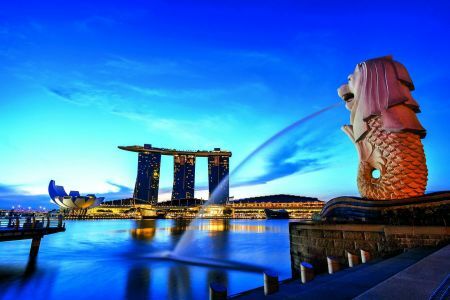 Late evening, I spent at Merlion Park when the sun is about to sat. This is the best place to take a few shots of the beautiful Marina Bay with the iconic Merlion and Marina Bay Sands in the background. I took Boat Quay, a historical strip along Singapore River. Clarke Quay, not far away, is typically more popular among tourists, but Boat Quay has just as much to offer. Its less noisy. Day 4 - The Chinese Garden, also known as Jurong Gardens, provides a stunning array of traditional Chinese gardens set against the architectural beauty of a 7-storey Pagoda and a gorgeous arch bridge. In the Gardens of Abundance section, one of the newest gardens, you'll marvel at the 100-year old pomegranate trees nestled among statues representing the 12 Chinese Zodiac animals. 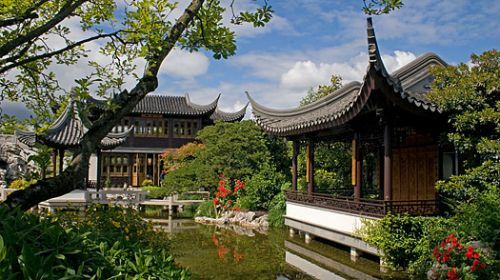 Admission to the main garden and Bonsai garden are free. However, ticket prices for entrance to the Garden of Abundance and Live Turtle & Tortoise Museum are $2 for Adults, $1 for Children and $5 for Adult, $3 for Children respectively. We went for Night Safari riding a tram through the Himalayan Foothills, Indian Subcontinent, the Burmese Hillside and more before getting out and walking along the interconnected trails under the moon light. You also won't want to miss the highlight of this tour - Creatures of the Night Show. 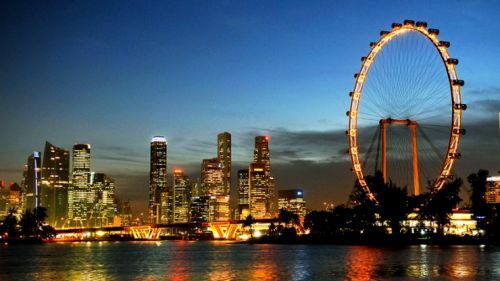 Day 5 - Singapore is a shopping paradise, from massive malls to open-air boutiques. I headed to Orchard Road to empty our wallet. 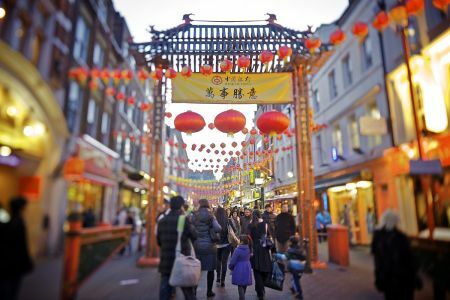 For full, cultural experience, head to Chinatown. I skipped the large common-goods shopping malls and went to Yue Hwa Chinese Products Emporium, just a block away from the heart of Chinatown, selling Chinese goods ranging from traditional medicine to porcelain figures. Visit the second floor lobby for an amazing selection of Chinese tea, from the inexpensive loose-leaf teas to costly teapots. I picked up some bak kwa (barbecued meat). Wander along the vendor-packed Pagoda, Sago and Trengganu streets , and pick up some gorgeous fine silk, jade jewellery and Singapore souvenir t-shirts. 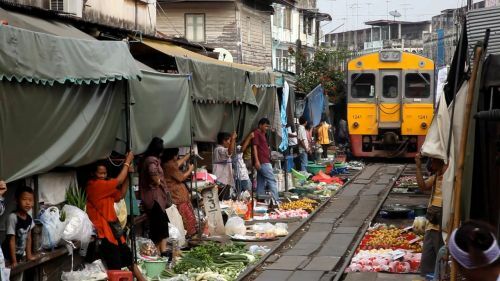 Maeklong Railway Market, is a unique market that is held every day literally on the rail tracks. 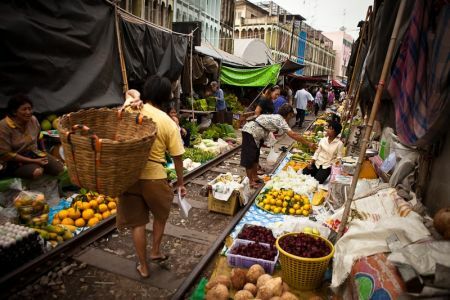 Maeklong Railway Market, nicknamed as Talat Rom Hup, meaning the "umbrella pulldown market". 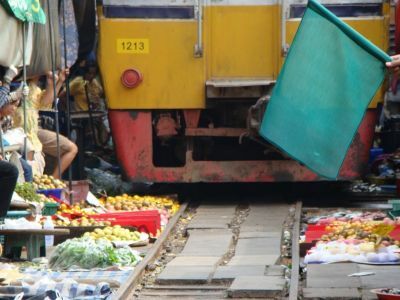 It is one of the largest fresh seafood markets in Thailand, and is centred on the Maeklong Railway's track. The action at this busy market begins few minutes before the train is due to pass through the market. As soon as the siren signals the arrival of the train, the shoppers will hop off the tracks, and vendors will quickly pack their goods and prepare to close/retract their awnings from the train track as the train passes by. Once the train is gone, its business as usual as if nothing happened. This is a usual event for locals since 1905; but it is an out of the world experience for all the tourists come to this market, just to witness this. These are the times the train is scheduled to pass through the market 6:20am, 9:45am, 10:20am, 1:45pm, 2:30pm, 6:22pm. 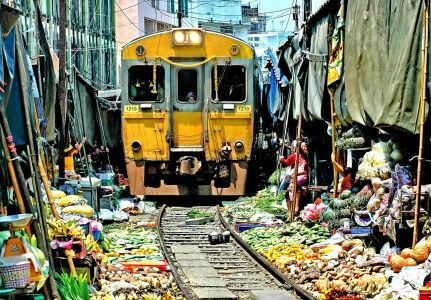 This famous Maeklong Railway Market is at a distance of 82 kms from Bangkok. Thailand is one of the favorite holiday destination for tourists from India. You can avail 2 types of Visas for travelling to Thailand. (1) The visit is strictly for tourism purposes. (2) The passport must be genuine and should be valid for at least 30 days. (5) It will also be necessary to prove that you have funds of at least 10,000 THB (250 USD) per person and 20,000 THB (500 USD) per family during your stay in Thailand. (6) A fee of 1,000 THB (decreased from 2,000 Baht) is payable upon entry and is subject to change without notice. It must be paid in cash and Thai currency only. (7) Submit one 4 x 6 cm. headshot photo taken no longer than 6 months. If you’re in Thailand for longer than the 30 days, then you can pre-emptively apply for Visa to the Royal Thai Embassy. The regular tourist Visa can be obtained from the Royal Thai Consulate General present at New Delhi, Chennai and Kolkata. It takes 3 to 5 working days for visa processing. 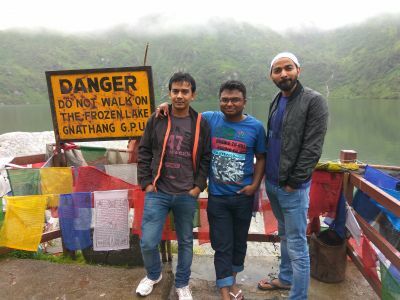 I started my Darjeeling, Sikkim and Bhutan bike trip with my 4 friends from Bangalore. We landed at Darjeeling's Bagdogra airport at night. At the airport we took a cab and went to Darjeeling city. 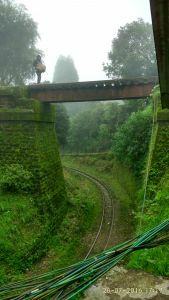 Darjeeling was covered with mist and fog; and the climate was soothing with tea plantations all across the roads. We first checked in to the hotel, got fresh. And then moved to collect our bikes to kick start our Eastern India and Bhutan exploration trip. 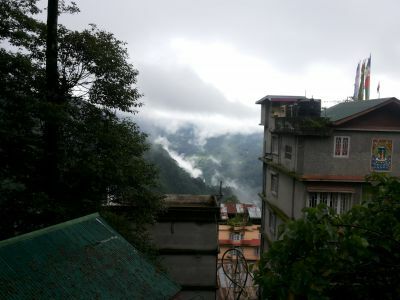 Next day morning, we went to Sikkim (Gangtok) which was approximately 100 kms from Darjeeling. 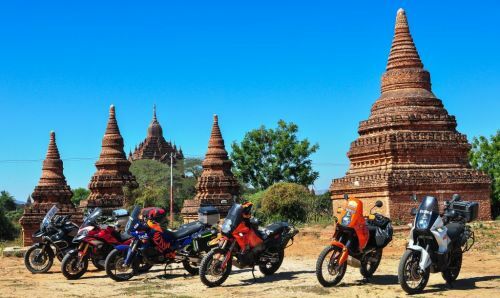 The ride was full of fresh air, forested mountain valleys and long stretches of snow-clad mountain peaks. 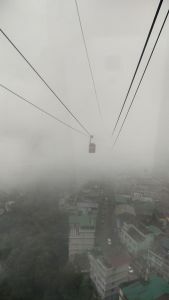 We took the cable car ride in Gangtok and witnessed the stunning views of the picturesque Gangtok town. The ride covers a distance of one km in just seven minutes and allows one to enjoy a bird eye view. We boarded our ropeway ride from Tashiling station. Later we explored many beautiful waterfalls which were close to our hotel. 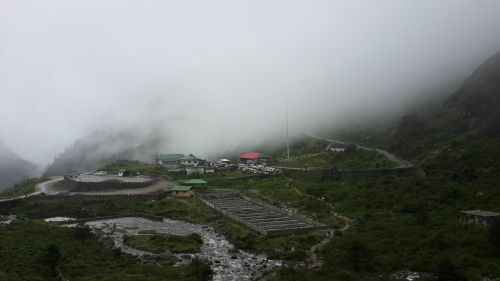 We gave a miss to Rumtek Monastery which is located 24 kms south-east of Gangtok. There are lot of markets in Sikkim which over local cuisine and sell many Tibetan goods. Next day morning we went towards Ghantaghar to meet an agent who could arrange the entry permit Nathula. The agent charged us INR 200 per vehicle. But you can directly get the permit in INR 100 if you have some extra time to spare. You will need to submit an photocopy of ID proof and a photo to obtain this permit. Nathula permit is granted only to Indians. Tourists are not allowed on Nathula on Mondays and Tuesdays. 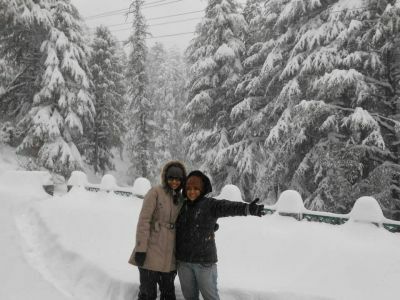 Nathula remains closed in winters due to heavy snow. 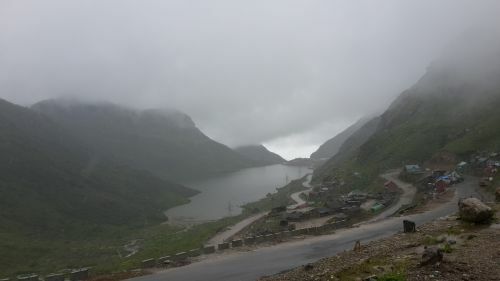 Nathula is located around 56 kms from Gangtok at an altitude of 14450 ft. It is one of the highest motorable roads in the world. We had to leave our bikes down and walk for some distance to get close to the border. Photography was not allowed near this region. 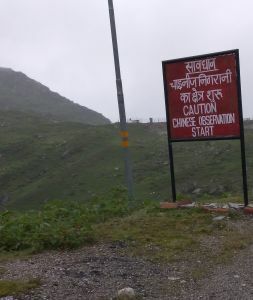 We had gone close to the international border from where we could see the Chinese soldiers on the other side. While coming back from the border; we visited Baba Harbhajan Singh Shrine, Tsomgo Lake and Siva temple. The stories around "Baba" Harbhajan Singh was very touching. Harbhajan Singh was a young Indian army soldier who died near the Nathula Pass in 1968. Legend has it that he had appeared in a dream of fellow soldiers who were patrolling the border, and had expressed the desire that a monument be built his memory. Since then the Baba Harbhajan Singh Mandir was built in this place and the mandir has acquired the status of a pilgrimage centre. As per local legend, spirit of Baba Harbhajan Singh is still guarding Indian armies at these high altitude region. We later visited the Tsomgo Lake aka Changu Lake, which is one of the highest lakes in India. The lake lies at an altitude of 12,400ft and is frozen in winters. It was a beautiful lake, and the lake water had the reflection of nearby peaks. There was option for Yak riding near this lake. We had to walk for some distance to visit the Shiva temple. The view of large Shiva statue in middle of trees and waterfalls was breathtaking. We had stopped by many cascading waterfalls on our way. Next day, we started our ride towards Bhutan via Siliguri. 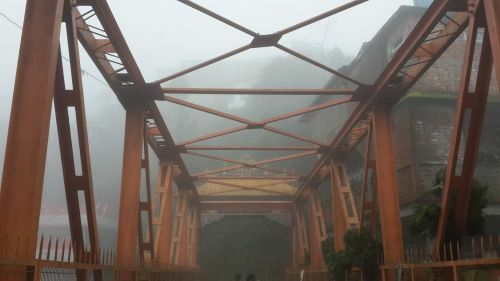 The ride was through foggy road and the visibility was very low. En-route we visited Jaldapara National Park. This park is famous for one horned rhinoceros. Next morning took permit to enter Bhutan. We had to provide original id proof to get the permit. Phuentsholing city is the first city that you get when entering Bhutan. We visited some monasteries on the way. And stopped over for shopping. If you have extra time then you can visit the famous Taktsang (Tiger’s Nest) Monastery in Paro. It is a unique monastery is located in a cliffside. You can also visit the 2nd longest suspension bridge of Bhutan at Punakha. 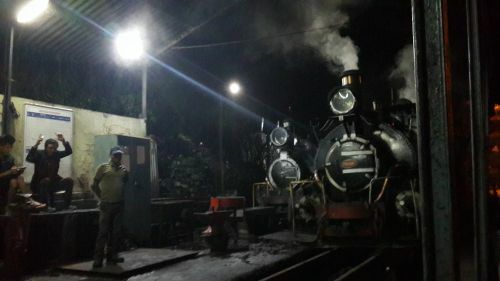 We returned back to Jaigaon at night. Next day, we started our ride back to Darjeeling which was approximately 200 kms away. On the way back we visited Tiger Hills, Rock garden, botanical garden and Japanese temple. The ride was full of waterfalls and surrounded by snow-clad mountain peaks. You get amazing views of Kanchenjunga snow peaks and the valleys from Tiger Hill. You can also board Toy train from Ghoom Station but it is very expensive. Next day we returned back our bikes and took cab to reach Bagdogra. 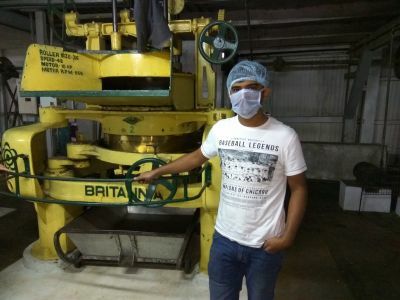 On the way back, we went to tea factory where a worker showed us the whole process of tea manufacturing. We reached Bagdogra at 4:00 PM and later flew back to Bangalore. Day 3 (Vietnam): Hanoi to Halong. Overnight stay on cruise on Halong Bay. Day 4 (Vietnam): Cruise on Halong Bay. Back to Hanoi. Day 6 (Cambodia): Full day Angkor tour. Explore mystical temples of Siem Reap in detail. Day 7 (Cambodia): Full day Angkor tour- Small Circuit and highlights of Grand Circuit. • Cruising on the beautiful Halong Bay and witnessing thousands odd-shaped limestone rocks and karst grottoes. • Visiting the famous 10th century temples in Hoa Lu in Ninh Binh. - All entrance fees and sightseeing as mentioned in the program. - Local English speaking guide(s). The package price is derived based on minimum 2 people for booking; and stay in 3 Star hotel in Hanoi and Siem Reap, and Phoenix cruise stay in Halong. Valid from 1st October 2016 to 31st March 2017 (Except for 24/Dec/2016 to 4/Jan/2017 and from 26/Jan/2017 to 6/Feb/2017). Please contact Navigers for customized price details of these exception days. • All kinds of transportations, Parking Charges and luxury Taxes as per the itinerary.